Leland Faust unmasks Wall Street’s unsavory tactics in powerful detail by giving readers a high-level view of how the financial services industry misleads them, overcharges them, and exposes them to needless risk. He documents the financial industry’s alluring come-ons, airbrushed risks, high-stakes gambling, half-truths, misleading statements, outlandish predictions, tricks to overcharge customers, bad deals, and outright fraud by the most prominent and renowned of Wall Street’s players. A Capitalist’s Lament is about what happens when financial firms and their employees forget whose interest they are supposed to protect. It shows how making foolish or wrong predictions is of no consequence to those who make them and how Wall Street luminaries with poor track records still garner celebrity status. Most of all, it spotlights how Wall Street manipulates the system and furthers its own interests at its customers’ expense and puts us all at great risk. Here is what you need to know to protect yourself from business as usual” and get ahead—instead of getting taken. "Leland Faust is a Wall Street/street soldier. I’m a community street soldierone who wants to eliminate violence from the community. Leland wants to eliminate hucksterism, fraud, gambling and price gouging from Wall Street. Good for him. We’re on the same page. This book is the truth. It will blow your socks off." 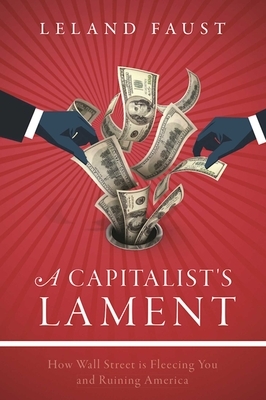 "A Capitalist’s Lament is a unique bookinformative and entertaining. We all need to have a better understanding of how Wall Street takes from us and influences public policy. You will laugh and cry as you read Leland Faust’s retelling of his many years of experience and his penetrating observations." Duane Kuiper, former Major League infielder and ten time Emmy Award winning broadcaster for San Francisco Giants.